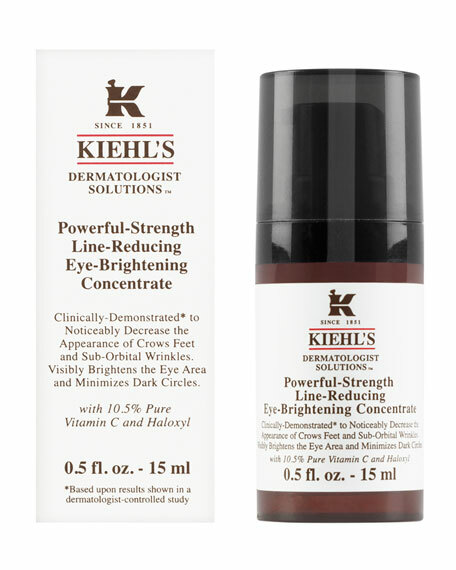 Kiehl's Since 1851 Powerful-Strength Line-Reducing Eye Brightening Concentrate, 0.5 oz. A line reducing eye treatment for brighter-looking eyes. An effective line reducing eye treatment for brighter, younger-looking eyes. Contains a potent concentration of Pure Vitamin C 10.5%, known for its affinity with skin and powerful ability to improve the appearance of aging skin. Contains Haloxyl, which strengthens, soothes and brightens the eye area, helping to eliminate dark circles. Haloxyl: This new, patented ingredient improves skin around the eye area by stimulating natural enzymes that help strengthen under-eye area capillaries. Studies demonstrate the effectiveness of Haloxyl and its ability to increase skin density to better support the microvascular network in eye area skin and alleviate inflammation. Apply a small amount of eye treatment with fingertip along the orbital bone and under eye area. Pat gently without pulling the skin.